The Republic of Moldova is situated in the south-east of Europe, along the two rivers Dniestr and Pruth, between the territories of Romania and Ukraine. Until the dissolution of the USSR it was an independent Soviet Republic within the frame of the Soviet empire. As an economically as well as culturally relatively unimportant location, the western world took hardly notice of this little new state on the European map. No extraordinary scenery, no seaside-resorts, not the origin of any internationally known personality, but at the same time no political or ecological scandal brought them on the international scene. Aim of this brief report it is not to describe the countries' historical and ethnic background, its aim is more to give an overview about facts. 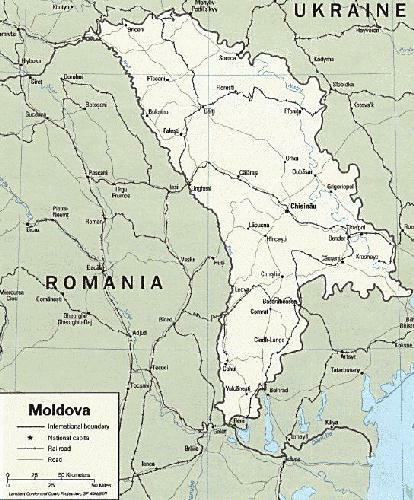 To form an image, an idea what Moldova is and what problems the Moldovans are confronted with. Most recent data were taken from the Economist Intelligence Unit and the CIA World Factbook 1996, more general information about the county appeared mostly similarly in all used publications. Moldova marks the south-western end of the great Eastern European Plain in the foreland of the Eastern Carpathian Mountains. The south-western limit of the country is marked by the Pruth river which is at the same time the border line to Romania. In the north-east the border with the Ukraine is a little bit north-eastern of the Dniestr river. In the south it is separated from the Black Sea by the so-called Budshak (turk. for angle), the part of the Pontic plain between the mouths of the Dniestr and the Danube from the Black Sea. It is a low land area, the territory is partly plain and partly hilly with an average height of 150 metres. The highest point is the Mount Balaneshty at 430 metres. With its 33,700 square kilometres the Republic of Moldova is one of the smallest among the CIS states. Just the Transcaucasian Armenia is smaller. Its surface is as big as Belgium, but with just half of its population. The surface is mainly built by young rocks whose tectonic demands and a varying resistance leads to a varied relief. Natural resources hardly exist. The territory is a so-called rolling steppe, with a gradual slope south to the Black Sea. The climate is moderate continental and rich of sunshine. The summers are hot and the winters are not too cold. Nevertheless the average temperature for January (-5°C in the North and -3°C in the South) is no guarantee for white winters: snow is rare. The cold does not seep into the ground. The wintertime is relatively humid, so the soil can store humidity. The spring temperatures begin to raise early in the year and the vegetation period endures long. Fruits and vegetables ripen about 20 days before they do in Central Russia. The average summer temperature in Moldova is between 19 and 20°C in the North and one degree more in the South. The differences between daytime maximum values (38 to 40°C, close to the ground even sometimes 60°C) and the cold nights are huge. The autumn is long, sunny and warm. The heated up Black Sea emits its temperature towards the continent. This grants for a perfect climate and a long period for fruits, wine, tobacco and maize to grow. Precipitation is very different from one year to another. This is the reason why artificial irrigation is usual and necessary. The vegetation corresponds with the characterised climate: warm loving deciduous woods in the higher steps (oak trees, beeches and horn beams) meadow-steppe in the north and the drier feathergrass-steppe in the south, natural humid meadow based on the deep karst-valleys. The forest ground is covered by a close meshed mosaic of brown and grey forest grounds/soils in the higher steps, different types of black soils in the lower layers. Moldova has a huge deposit of building materials as well as resources in gypsum, lignite and phosphorites. About half of Moldova's territory is arable land, 13 percent are permanent crops while 13 percent are meadows and pastures. Good soils (mostly black soils) cover almost three quarters of the Moldovan territory. A good climate favours between two and three harvests a year. Fruits, vegetables, vine, corn and cereals are cultivated: Molova was known as the 'vegetable garden of the USSR'. By over-fertilisation and an excessive use of pesticides the yields are put at risk. There is a need to import corn from abroad. In 1994 drought and flood caused a fall in agricultural production. Most environmental problems are related with the intensive agriculture. The persistent heavy use of chemical fertilisers and pesticides caused a strong poisoning of the soils. Between 1967 and 1989 the soils were supplied in average with 17 kilograms of pesticides per hectare. This meant a injection of poison 13 times above the Soviet average. Today the agriculture of Moldova suffers from the damaging of the humus soil layer and the erosion of soils. Another major problem is the water pollution especially of the Dniester river. The extraction of building materials lead to a destruction of the landscapes, majorly by the destruction of forested areas. The population was estimated at 4.464 millions in mid-1996. The population density was 132 per square kilometre, the highest among the republics of the former Soviet Union. The population growth rate was one of the lowest in the Soviet Union with a rate of natural increase of only 1.18 % a year (est.). The population is fairly divided between urban and rural areas, at 46.6 % and 53.4 % respectively in 1990. The high ratio of the population in rural areas meant that while Moldova's net material product (NMP) was only about 80 % of the Soviet average, living standards were high in terms of availability of food and consumer goods. The Moldovan population is ethnically very mixed, with Moldovans accounting for 64.5 % (in the 1989 census), Ukrainians 13.8 %, Russians 13 %, Gagauz 3.5 %, Bulgarians 2 % (1). Russian is the most widely spoken language in the country, particularly among the minorities. A majority of 98.5 % of the over-all population belongs to the Eastern Orthodox church, the remaining 1.5 % are Jewish (2). Health and educational provision was apparently fairly high during the Soviet period. Hospital beds, at 129 per 10,000 inhabitants were around the USSR average, and the infant mortality rate, at 19 per 1,000 life births, was below the average for the entire Soviet Union of 22,7 in 1989. General Living conditions deteriorated during 1992 and 1993 as real wages declined steeply. There are no exact data on the fall in living standards and the deterioration in health care, but these can safely be assumed to be severe. For instance, expected infant mortality has risen in 1996 to 47,6 per 1,000 life births, and since independence the country has experienced severe outbreaks of diphtheria, cholera and other diseases associated with a deteriorating health infrastructure. The improvement in real wages in 1995 and 1996 are far from making up the lost ground. Agriculture is the dominant sector of the Moldovan economy and became increasingly important through the 1980s. Its share of GDP rose slightly from 29.6 % in 1985 to 31.3 % in 1991. By 1995 the share of agro-industry had risen to 60 % of GDP, although this figure also reflects the exclusion of Transdniestr and its industrial base from recent Moldovan statistics (3). Crops have traditionally accounted for the lion's share of agricultural production, with an average 60 % of the value in 1990-92. Until recently 60 % of agricultural production was by collective farms, with the rest divided equally between private farms and state farms. The share of private farms is expected to increase as reforms get under way in Moldova. Although there is a memorandum on land privatisation until the year 2000, the government intends to ease restrictions on leasing inheritance in 1996. Around 75 % of Moldova's agricultural land is black earth, the world's most fertile soil, and in the Soviet era the country produced 40 % of the Soviet Union's tobacco, 10 % of fruits and 5 % of vegetables. However, the country's location makes it prone to marked changes in weather conditions, and agricultural production always fluctuated. In 1992 and 1994 drought devastated the local harvest and the country had to import grain. In contrast, the 1995 harvest of grain, barley and peas, at 1.7m tons, produced an export surplus. Moldova's wine industry is considered the sector with the greatest potential for export growth provided the industry can raise its standards to western levels and develop brand recognition and internationally acceptable quality control. The country produced around 30 % of the Soviet Union's wine and brandy, although the industry suffered from Mikhail Gorbachev's anti-alcohol campaign which involved the ploughing up of more than 40 % of Moldova's vineyards. Industries. In 1993 industry accounted for 33 % of GDP, ranking second after agriculture. Food processing and light industry were the dominant branches, accounting for about 34% and 25 % of total gross industrial output respectively in 1991. Engineering and metalworking increased in the 1980s and by 1991 ranked equal with light industry. According to data made available to the IMF by the Moldovan authorities, industry grew at relatively high, albeit slowing rates - the annual averages were 9.2 % in 1971-75, 5.7 % in 1976-80 and 4.3 % in 1981-85. The rate fluctuated in the late 1980s, but according to World Bank figures there was a sharp contraction of 11.1 % in 1991, followed by a further fall of 29.5 % in 1992. These figures reflected the war in the Transdniestr region, which has caused a sharp fall in the republic's output of electrical machinery, power transformers and cotton fabrics. In 1991 Transdniestr accounted for 28 % of total industrial capital and 36 % of output. The increased cost and unreliable supply of fuel and raw materials and the loss of markets also contributed to the decline, while the influx of foreign investment has been insufficient to make an impact. The industrial recession has been prolonged, with year-on-year output falling by an estimated 31 % in 1994 and 6 % in 1995, although towards the end of 1995 month-on-month output finally started to grow. Energy. Moldova is highly import-dependent in energy. In 1990 domestic sources accounted for only 1.1 % of primary energy consumption. Traditionally oil accounted for about 40 % of total energy imports, followed by coal (28 %)and natural gas (24 %); imports of gas, however, tripled between 1985 and 1990. Reliance on energy supplies from the former USSR has caused serious problems for the Moldovan industry. Severe power disruptions have been experienced because of erratic supplies (including the disruption due to energy supply lines having to cross the separatist Transdniestr region) and the effects of Russia, its main supplier of liquid fuel and gas, raising the price to market levels. Due to a combination of severe recession and price liberalisation, Moldova's oil consumption has shrunk by almost 50 %. The country has diversified its liquid fuel supplies, and now obtains 50 % from non-Russian sources, including Romania, Bulgaria, Italy, and Greece. For gas, Moldova, like the rest of the region, remains dependent on the Russian gas giant, Gazprom. In 1995 Moldova gave Gazprom a 51 % stake in a new pipeline venture with the national gas distributor, Moldovagas, in return for a write-off on some $220m of debts. As of January 1996 debts to Gazprom had mounted again, to $246m, as local customers failed to pay their bills. Recent energy policy has focused on domestic exploration; Moldova's known oil resources are estimated at 10.6m tons, and the government has awarded a 20-year exploration concession to Redeco of the US to drill in the south-western field of Valeni. A major handicap for people interested in Moldova is to gather any kind of recent data. In the past the Moldavian Soviet Republic was mentioned as one among all the others, and as it was one of the smallest, it did not attract too much interest. Nowadays the situation is a little bit comparable, the public interest on transition processes in Eastern and Central Eastern Europe is concentrated on the bigger powers. It seems that there is not really a reason for an interest in this small country in the south-eastern edge of Europe. Basically the problems are the same as in other transition countries, but is it not even harder to raise any kind of funds, sponsors and investors if a country is unknown? Bütow, Hellmuth G. (Hg. ): Länderbericht Sowjetunion. Wien: Carl Hanser Verlag, 1986. Bundeszentrale für politische Bildung: Gemeinschaft unabhängiger Staaten. Informationen zur politischen Bildung. Franzis, München Oct. 1995, p. 321ff. Götz, Roland/Halbach, Uwe: Politisches Lexikon GUS. 3rd revised ed. München: Beck, 1996. Kappeler, Andreas: Rußland als Vielvölkerreich. Entstehung, Geschichte, Zerfall. München: Beck, 1992. Karger, Adolf: Die Erblast der Sowjetunion. Stuttgart: Kohlhammer, 1995, p. 116-126. Statistisches Bundesamt: Länderbericht GUS-Staaten 1994, Stuttgart: Metzler-Poeschel, 1994. Stölting, Erhard: Natonalitäten und Religionen der UdSSR. Frankfurt/Main: Eichborn, 1990. The Economist Intelligence Unit: EIU Country Profile 1995-96, 1996. Zimm, A./Markuse, G.: Geographie der Sowjetunion. Studienbücherei Geographie. Gotha, Leipzig: VEB Hermann Haack, Geographische Kartenanstalt, 1980. Source: IMF, Economic Review: Moldova. Source: World Bank, Statistical Handbook: States of the former USSR. a) Input basis, on an assumed generating efficiency of 33 %. b) Net transformation comprises transformation input and output, plus energy industry fuel and losses.